I remember a couple of years ago 3D pictures were really popular made up of lots and lots of really small pictures. I’ve not seen it done before with photos, a really cool effect! Those 3D posters and books from a few years ago were “hidden image” photos, also known as Magic Eye images. These are completely different. Rather than computer generated, these images are true 3D information captured from the real world. I’m glad you like them! This is quite awesome and I remember using the cross eyed technique to force the magic eye posters as well, however this is indeed amazing! However, I’m finding it a bit of strain on my eye when I try the cross eyed technique with these pictures, but it could be cause I haven’t crossed my eyes for years =P. Wow! i got it the second time around! 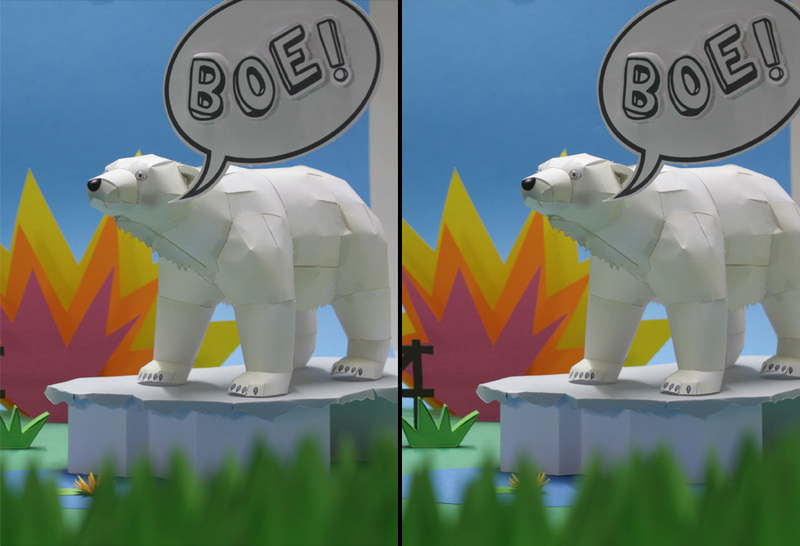 Never quite did understand stereophotography, but your tutorial helped. The effect really is stunning! Thank you! Take your stereo pair and, instead of putting them side by side, put them in the same spot, alternating rapidly–one after the other in an animated GIF or some other type of animation. It creates the same illusion of depth without having to cross eyes, although the image is a bit shaky. Never tried it myself but I saw it on a website somewhere and it was effective–I imagine it would take some experimentation to get the right framerate. @tc – If you’re finding it a bit of a strain, try sitting further back from your screen. That reduces how much you need to corss your eyes, and should result in less strain. @Sprengstoff – Congratulations. It’s one of those things that when you get it you truly “get” it, isn’t it? I’m glad you enjoyed it. Why not try making your own and entering one in my 3D photography project 3D For Everyone? @Chris – That technique isn’t really 3D at all. It’s a trick to make something seem 3D-ish, but since each eye is getting the same image, there’s no way the human brain will literally interpret it as a 3D image. The cross-eye stereo photos really seem to have depth. What do you think of “parallel-eyed” technique compared to “crossed-eye” technique? I find “crossed-eye” a bit of strain while “parallel-eyed” is a bit relaxing. And, “parallel-eyed” technique allows me to see bigger for the same two original pictures. But, when two pictures become bigger, I will have problem in merging into third picture already. I am thinking about buying a Loreo 3D Lens-In-A-Cap to use with my dSLR camera to capture non-stationary objects in 3D. That will produce “parallel-eyed” picture pairs. I have a peculiar predicament. I see the four images and I can focus the inside two into one but the image in the middle that i see is not in 3d.Do you know why this is happening? Ok follow up post,don’t bother.I see it now and it really is quite amazing. I just had to focus longer! The images will only merge for me if I tilt my head about 30 degrees to the right. I’m not an ophthalmologist, but I guess it has to do with the difference between the axes of the eyes. I have been “playing” with my eyes like this since I was born, although never thought of using this to see images in 3D! :D Thanks for a really great post! @ZinY I first learned the crossed-eye technique, and that has always been more comfortable for me than parallel view. Possibly that is simply because I was used to that first. I actually am planning to write an article about the two free-viewing techniques for the blog, but I think it will take quite a bit of research. If you subscribe to the blog (top right), you’ll be informed of any new posts, including the free view technique one planned. If I don’t tilt my head, the images get one above the other when I cross my eyes. And I noticed that when there are many details in a photo, it’s harder for me to align all of them, thus harder for my eyes to stay focused. PS: The Panoramas and Profile links at the top of the page here give a “404 Not Found” error. Just wanted to let you know. For me, I started with parallel-eye method. After getting used to cross-eye it is now becoming (a bit) difficult to see in parallel-eye. I do subscribe to your feed in RSS. I am waiting for 3D-Lens-In-A-Cap-Digital coming out in June. Some people do convert photos from parallel-eye to cross-eye after taking with Loreo lens. But, I still can’t decide whether I should see/keep/show my photos in parallel-eye or cross-eye format. I would like to hear comments on this by you and other people as well. Dude!!! My eyes are hurting after doing this like 6 times in a row. Can this destroy my eyes? And when the image is getting better my eyes focus quickly back to normal. Neil, Thank you for an amazing technique and taking the time to produce an excellent tutorial. I thought the image above of Lum was excellent and got me hooked instantly! Oh my god! I tried hard and hard. I finally got the image locked, but I couldn’t focus. and then BAM I could see it. That was great… wow… very cool. Thanks for such an interesting post. I am going to try this with some of the 3D artwork we produce too for sure! effort to master this “cross-view” trick, I have developed special PRISMATIC glasses that remove a major part of the converging. Most people who fail originally to cross-view successfully, can with the glasses. This greatly reduces the small risk to delicate eyes. Google “prism 3D cross-view glasses” and find what’s available online from me or other sources. are you using the loreo lens-in-a-cap and then altering the photos to make them cross-eyed format instead of parallel? if so, is there an easy way to publish them L-R-L so viewers can decide whether to view cross or parallel? some of your shots are quite interesting! this is the bomb! I love it! Didn’t get it at first but when I did, I got addicted! haha nice work! Wow! I find once I’ve aligned the images, relaxing my eyes just a little keeps them aligned but allows the image to sort of drift slowly into focus. It’s really cool! I didn’t know it was possible to see the 3D effect in images without those 3D glasses and stuff. great one, thanks for share! great site. These pictures are SPECTACULAR!!!! they are incredible and I’m now obsessed with this type of 3d. I’ve tried it myself and it sort of works, but then again it doesn’t. I noticed that you have used one picture in some cases, but made them into two different ones (which then turned out 3d). How did you do this? Please explain because I would love to do this, if I only had to take one photo, but can still make it cross eyed 3d, it would be FANTASTIC!!!! It may damage my eyes. I will sue you. haha.. I’m joking ! I have tried this many years back. Take two prints of the same shot (Even a passport size photo)and keep it about 6 inches apart and 2 feet away from you. (vary this distance according to the size of the photos you have.) Then look at the center of the gap between the photos in the manner mentioned in this article. We will come across a third photo in the center and this photo will have 3D effect. It is really fun !! And once again, a very big _thank you_ !! Wow, this is really really cool. At first I though I couldn’t do it. But after few minutes of practice I was perfect to focus the impinged 3d image. Thank you. The images on this site are swapped incorrectly. Do not reverse images when making stereo pairs. Much of the information on this page is completely wrong. The description of crosseyed viewing actually requires a form of walleye diversion that exceeds the parallel limit at infinity. They eye does not want to do this. The descriptions calling for reversal of stereoscopic images for open eye use are wrong. When someone mentions two “types”, that is your red flag for wrongness. There is only one type. Crossing the eyes fuses the images, not reverses them. Therefore, they didn’t need to be swapped in the first place. People get themselves worked up by the word “cross”, needlessly. The reason stereoscopes exist is not to swap the images, but to allow them to be brought close to the eye, as they can then be much larger and would overlap. Stereoscopes deal with overlap, not swap. This is the cause of a number of complaints people have in viewing. Patients can even confuse their optometrists, because the optometrists assume the stereo images that their patients saw at home are placed correctly. People with Ph.D.s and major science sites get this wrong nearly all the time when making stereo pairs. Worse, most of the websites on Teh Internets are wrong, because they copied off of each other. Some even have mixed types of test images, and do not mention this. Be careful before refuting this: Your eyes use many different types of cues to create fusion, and can partially fuse a number of features, although the overall picture will have at least some problems. Try manually putting the images in the same locations that the eyes would have seen them, like a stereoscope does, and it will work great. The hard part is when you locked the image, how the blur image can become clearly ! Because it’s similar to seeing a near object, when you look at a near object, the further objects will become blur, that is the natural reaction of the eyes. Thanks Neil. You got me insired. @beshart Nice 3D images there! Good start. I would suggest using a wider stereo base, those examples don’t look as “deep” as I would personally prefer. Once you’ve had a bit more practice, look into learning how to place the 3D window. There are some window violations in your photos that could be improved for a more comfortable 3D experience. Great,thanks alot, it worked for me the first time I tried. The instructions you provide is so great and especially the GIF picture! I thought I would never know how to see a 3D photo. Thanks! I’ll teach my friends to do it using your methods. This only works if I transfer the 2 photos to a graphics program and then swap them. Then I get a great 3D effect. I used to take stereo photos many years ago and I can recognized incorrectly ordered pairs right away. That is really cool, and once you learn it, it’s quite easy to get into 3D images. However i wonder whether it is harmful to our eyes ? I have created a 3D effect with Microsoft Paint pasting in an image one at a time offsetting it using either the File Menu/Paste From or File Menu/Copy/Paste. I could send an example to Mr. Creek as an attachment! its my first time to see this way, its quite hard but great pictures though! I am one of those whom No method to see in 3-D works for. My depth perception is low and I actually used to be cross-eyed. I have grown out of the crossed vision but when very tired my eyes will still cross to this day. I tried but to no avail, even this method wouldn’t work. 3-D glasses are worthless to me also because my eyes will NOT fuse the two pictures together into one coherent whole. It is cool, but I need some training. My eyes are both red now. True “cross-eyed” has you seeing what would appear as two or more images. The trick here is to focus behind the picture to have your eyes adjust, and they will adjust on their own, in such a way inorder to have the 3D image appear. Has there ever been a time, while at your computer, your eyes have gotten ever so slightly tired that when your eyes stared at the keyboard the keys seem to “come together” to appear in a sense, “extra” special three dimensional? Do you remember how your eyes felt when they focused this way? 1. Raise your arms straight out in front of you parallel to each other to where your hands are at “eye heighth”. 2. Form both hands as though you would be pointing at something with your pointer or index finger. 3. Now, turn the pointer fingers inwards to where the point of each is touching each other, point to point. 4. I noted the word focus earlier; fucus your eyes at the point where the fingers are touching each other then slowly shift your focus to an object beyond your fingers and the further away the better. 5. If you do this right you will notice that your fingers will appear to form a “sausage link” or a “frankfurter link” effect, and this can turn into an “illusion” that as you would pull your hands slowly apart or outwards, your fingers will appear to be a single finger that hovers or levitates in mid air. It took me three months to finnally figure out how to relaxe, and feel what this focus was like! Like good public speakers do, I repeat that the trick here is to remember what it felt like when you “focused” beyond the picture the first time and how your eyes adjusted to “see” the “hidden” picture. First off, thiers nothing unhealthy about crossing your eyes unless your eyes are underdeveloped. its extreem cross eyed vision, viewing something close up in the center of your vision 2-5 inches to your nose that can be harmfull. secondly ive heard alot of arguments between wether parallel or crossed pairs are best. I prefer crossed pairs and have 20/21 vision. I believe thier is a nasty culprit. My opinion is wether your right or left eye dominate decides if you can view crossed or paired images. This means studios arent producing bad 3D, thier simply not allowing enough options for thier viewers and need to before the movie have two theatres of crossed or parallel pairs and test thier audience to ensure people can see a 3D effect. Trying to universaly do eyesight wich is a person specific thing can be almost an impossible chore, people wouldnt need perscription glasses if everyone had the same vision. make sure if you guys are doing stereophotography work, grab someone who can see opposite of you to critique your photo work if you can only see crossed or parallel photos in 3D. regardless of the technique, you still have to cross your eyes to get 3D, you cross your eyes naturaly (you see cross parallel actualy) when looking at anything close up, books, reading your monitor etc. your eyes dont completely cross until you view something 2-5 inches in front of you from your nose. thier is a portion of the population wich is farsighted that cant see 3D stereo using this technique at all, also keep that in mind if you have problems viewing 3D images and reading, a trip to the eye doctor might be in order.